NEW pool, hot tubs, and club house available 50 yards from our condo! With a spacious 1240 square feet, you will feel right at home in our condominium! Located on the ground floor at the far end of the secluded Tamarisk complex, you'll be a five minute walk to town or the base of Peak 9. A stop for the free bus shuttle is also right out front. The inside of the condo is furnished exquisitely. The master bedroom has a Queen-size bed and its own bath. The second bedroom has two Full-size beds and an adjacent bathroom. Down the hall is the enormous great room that has a sleeper sofa that will accommodate two more. Pets are NOT allowed and No Smoking. After enjoying a nice powder day or hike in the summertime, visit the clubhouse for a soak in one of the four hot tubs or a dip in the outdoor heated pool. Or just come back to the condo to enjoy a warmth of our new gas fireplace! Laundry facilities are available onsite. We are a family of 6 who live in the Denver area and enjoy getting up to Breckenridge to escape our busy lives! Breckenridge is the ultimate mountain town. In addition to the world-class skiing and snowboarding, the town has something for everyone and such a great feel to it. When we stepped foot into our Tamarisk condo, we felt the same way and knew we had found our vacation retreat where we would spend countless family getaways. Our unit is very spacious and has a huge great room area where several activities can be going on at once- watching football in front of the fireplace, playing board games over in the table area, or preparing meals / enjoying cocktail hour at the kitchen counter bar. Finding a unit with so much "living" space was a dream come true for us... we never want to leave! Our condo complex is in an awesome location - a five minute walk to Main Street and the lifts at the base of Peak 9, as well as immediately on the free shuttle route. Even though close to everything, we are nestled in dozens of trees and maintain an air of privacy. 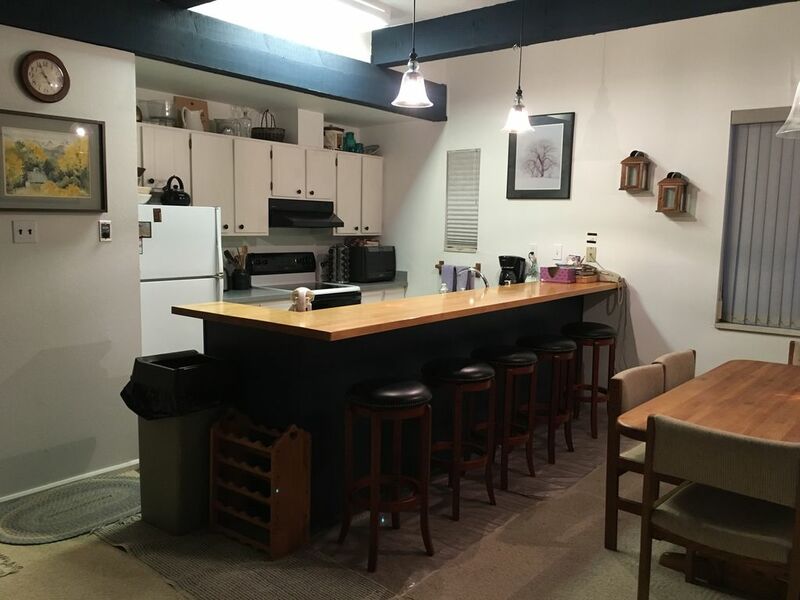 Our condo is an end unit and one of the most spacious in our building- over 1240 square feet. We are one of the few units to have a wood burning fireplace, and we also belong to a club house across the street with outdoor heated pool and indoor and outdoor hottubs. You will feel right at home in our "home away from home"! (2) Two coin washers are in the basement of our complex, about 50 paces from our front door. (2) Two coin dryers are in the basement of our complex, about 50 paces from our front door. Our Tamarisk complex has a parking lot reserved for our complex only. Cars without a parking pass will be towed. ***EFFECTIVE DECEMBER 2018: NEW pool, hot tubs, and club house available 50 yards from our condo!